The spring means more flowers are blooming and looking beautiful, but it also means that the heat is here to take its toll on indoor cut flowers. The fact is that any extreme temperature, hot or cold, is damaging to your cut flowers. However, there are some things you can do to keep them lasting longer and looking beautiful. Flowers delivered by a professional florist are normally cut before the bloom. This means that they will be fully open a day or two after they’re delivered. This helps make sure the recipient gets to enjoy these flowers for as long as possible. 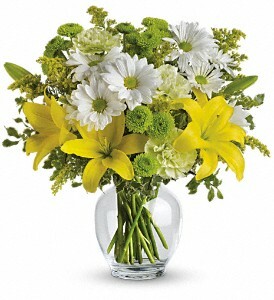 Flowers are almost always shipped express delivery so that the florist has them within a day of the flowers being cut. Any flower that hasn’t been sold within several days will be discarded, as will any flower that starts to look a little droopy or wilted. Here are some other tips for keeping your fresh flowers lasting longer. • Change the water if it starts to look cloudy or yellow. This means bacteria are growing in it! • If you rearrange your flowers, change the water at the same time. • Always fill the vase with warm water. • Use distilled water or filtered water if at all possible. Some of the chemicals added to tap water aren’t good for flowers. • Re-cut the stems every three days. Cut off one to two inches, cutting at an angle. Be sure to cut them under water so they don’t draw in air. • When re-cutting your flowers, remember that they will be shorter. Remove any leaves that will now be in the water because they can provide a place for bacteria to grow. • If you have flower food, add 10 grams each time you change the water. • You can add a little bit of sugar to the water to help strengthen the stems. Don’t add too much, though. • Keep your flowers out of direct sunlight and away from anything that gives off heat. • On the other hand, don’t put flowers right under the air conditioner vent, either. Cold air blowing on them is just as bad as hot. • If you’re putting your arrangement in a new vase, be sure it’s large enough. Trying to cram a large bouquet into a small vase or down a small neck can damage the stems. • Likewise, don’t place a small bouquet into a large vase. The stems won’t have much support. We’re ready to provide all your spring flowers in Kansas City, MO.